The Dawn Palace is abuzz with power games, and a cruel young child is cooking up a batch of poison. Princess Sadeia has an obsession that threatens the entire realm. Sadeia of the Dawn Queendom is just sixteen, but she has been the sole ruler of her land for years. She has to have control of all the reins, and everyone must yield to her will. On the other side of the ocean live the Sorrowdeer people. A sorrow-deer tells them how much sorrow each one of them will bear during their lifetime. A little boy called Uli gets a bigger gift than anyone else has ever received. He writes a message that is carried a little too far. 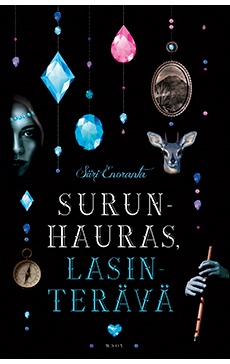 Siiri Enoranta’s novel is a tapestry of narrative voices. Everyone wants something, and everyone loves someone. The narrative is like a prism in which dreams, power relations and interdependencies are refracted and broken up. Siiri Enoranta (b. 1987) has been nominated for a number of prestigious Finnish literary prizes, e.g. the Runeberg, Finlandia Junior, Topelius and Kuvastaja awards in Finland. She is a three-time winner of the City of Tampere Literary Prize. The Sorrow-deer Tamer is her sixth novel. The Sorrow-deer Tamer was shortlisted for the Finlandia Junior Prize 2015, and was awarded the Topelius Prize 2015 as well as the City of Tampere Literary Prize.